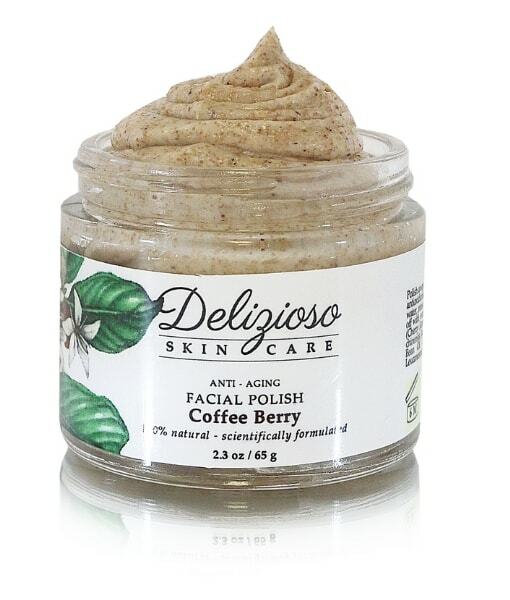 Polish away dullness for a more radiant complexion using this gentle scrub for all skin types. Paired with Coffee Oil and other age fighting antioxidants. Works towards keeping skin looking flawless and younger. Apply to the palms, dilute with a small amount of water, press the cream thoroughly all over the face and neck. ( * = Certified Organic) *Aloe Barbadensis (Aloe Vera) Juice, *Oryza sativa (Rice Bran) Oil, *Prunus avium (Cherry Kernel) Oil, *Coffea arabica (Green Coffee) Oil, Cetearyl Olivate and Sorbitan Olivate (Natural Olive Oil Emulsifier), Simmondsia chinensis (Jojoba) Proteins, Ascorbic Acid (Vitamin C), Ground Apricot Seeds, Pelargonium x asperum (Geranium) Essential Oil, Vanilla Bean Oil and Natural Antioxidant Preservative (Vitis Vinifera (Grape) Seed Extract, Populus Tremuloides Bark Extract, Leuconostoc/Radish Root Ferment Filtrate, Sambucus Nigra (Elder) Fruit Extract).